The group's seventh studio album opens with its anthemic title track, a cheerleader-worthy number that is rousing radio gold. But sometimes all that earnestness can overwhelm. 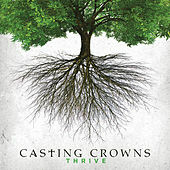 Casting Crowns actually shines brightest on understated tracks like "Just Be Held" or when they trade their big sound for some low-key strings. Thankfully, Thrive includes those mellower moments, all while encouraging listeners to dig deeper to discover a richer faith. In the end, Mark Hall & Co. managed to make an album that will satisfy longtime fans while throwing in a few surprises for the skeptics -- no easy feat.